I like these curtains very much they look great with my furniture, but was somewhat disappointed, one panel has a stain. I am very happy with the quality and color is just what I was looking for. I would recommend to family and friends.One final note, the quality control department needs to check more closely for defects. Refresh your room with the decorative geometric window panel. The scroll geometric print is simple yet trendy, available in a variety of colors to match your living room decor. The panel is made with a cotton blend basket weave textured fabric, softly filtering the perfect amount of sunlight into your home. Bronze finished grommet top makes it easier to hang, open, and close panels throughout the day. 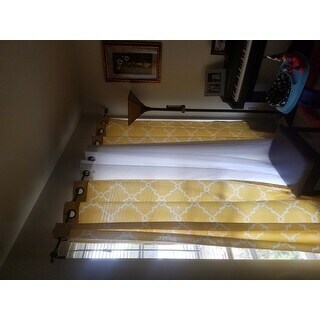 Includes one curtain panel. I really like the pattern and colors of this panel, and that I can buy single panels. I have 2 windows in my living room that require 48 inch single panels in a special configuration, and these worked nicely. The material and stitching is well done. I do recommend these! I ordered the 96" panel and made a valence out of the circle end which was about 14 inches long. Very nice with an interesting weave. Looks so expensive great quality!! I have zero issues with these! They are so cheap price wise and look just as good as all the expensive ones!! 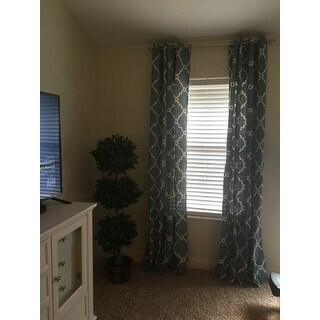 I bought these curtains after reading their many positive reviews. The only way I can explain the difference between what I received and what others received is that perhaps the product is "manufactured" in several different places... For the curtains I received: (a) the fabric resembled something between a printed woven plastic placement and a Handiwipe; (b) the stitches were long, seams veered widely off course in several places, and repeatedly were stitched back and forth with ragged loops of thread -- like you might see in a beginning sewing class for small children; (c) in places, the fabric had abrasions and weaving flaws, and some of those had been stitched over to hide them. The colors were dull and just plain ugly. 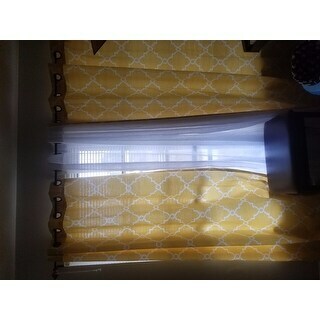 Overstock let me return them at no cost, which is a positive, but I think I've learned my lesson -- no more curtains from Overstock, regardless of the reviews. For these to get through to the consumer, quality control must be all but nonexistent for this brand, at least. Color Match is not even close!! This is not a review for a difference between on-screen and what I got. We all know there can be differences there. What I received was 2 COMPLETELY different colors. To be honest, what it looks like, is that they sent 2 new packages, and 4 packages of ones that sat out in the sun and are SEVERELY sun faded. The one color is blue/white -- the other is a blue-gray/cream - If all 6 had arrived as blue/white I would have been happy. Good thing we just moved in, and are having lots of people over this weekend and won't have curtains now. AWFUL. 5 seconds of inspection before shipment could have prevented this. Not sure if they think the customer won't notice, or won't care enough to go through the hassle of returning. These are getting sent back immediately. I like the pattern of the curtains. I got three panels of the beige, and I expected it to be a little brighter but it works. I will keep them anyway, I wonder if the grey curtains are darker than the picture. The only issue I had with the curtains was the length, it was like an inch short for my window. 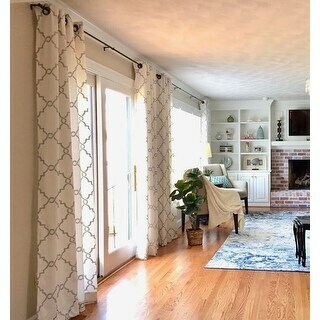 I just love these curtain panels! I ordered 4 panels of this drape for my daughters room. They hang very nicely and I got the 96 inch lengh. My only note is that they are not that thick and do not block out light that great. I have shades already on my windows so that helps block out light. I'd recommend getting another panel if you need to block light in the room you are intending to put this in. 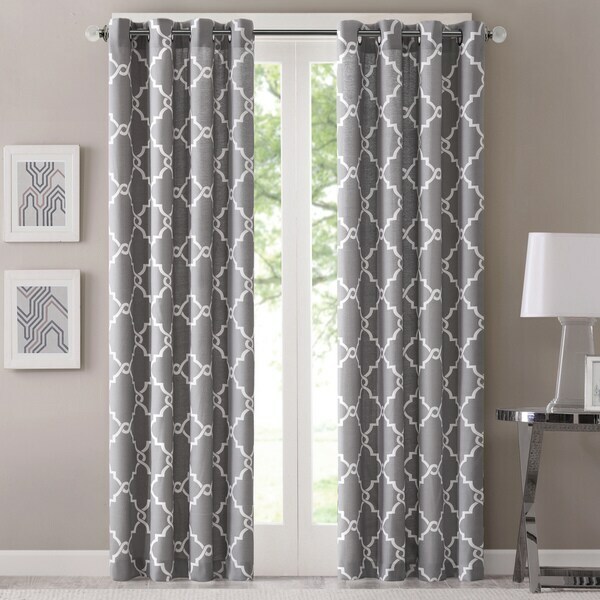 These curtains are perfect for our bedroom windows. We bought them to match our comforter and they are great. It is a nice thick material and looks great. The curtains arrived timely and they're truly beautiful for the price. After ironing them with a warm iron and hanging them I was very pleased with the length (108 inches) my family room looks great with curtains now. 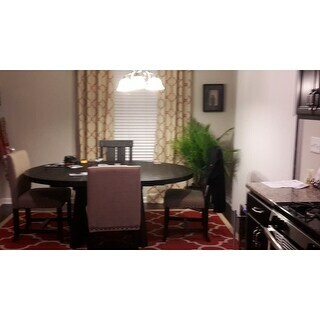 I also ordered the matching valance for my dining area to give both areas a cohesive look. Exactly as pictured heavy curtains they go perfectly with my rug. They look nice. I would buy again. They are fine but they sent the wrong color the first time and you guessed it I had to pay for shipping them back. Come on overstock, having to pay for a return is a deterrent to buying from you. I was really skeptical untill they arrived. So pleased I ordered more. Just wish they came even in longer sizes. Love them. Very well made and a perfect thickness. 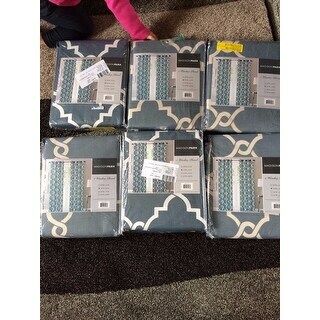 The fabric is an amazing quality for the price. 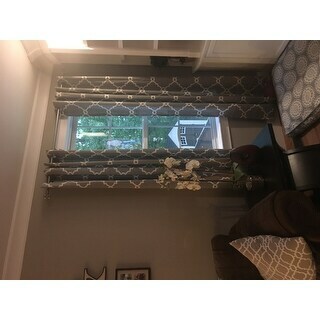 I bought these curtains in Ivory/Silver color for my living room. I love the way they look. They have a nice linen-like texture. The silver color pattern has a metal sheen. Looks like on the website. A bit thinner than I expected but will be okay. I love the pattern and the material of these drapes. They add a casual elegance to our living room. We’ve had them for months now and no complaints!! Very easy to hang. I love the length and the color! True to the photos. Also did not have any problems with wrinkles.They were very easy to hang up- had plenty of room for the rods and slipped on easily. I received so much compliment. Awesome curtains. I used this pattern as an accent for a living room window. It is perfect and ries everything together without being to matchy matchy. It is great while being very classic and clean. Color was yellow... not as pictured. We have these in our kitchen and they are a great addition to our home. They never have to be dusted as you see no dirt or anything and never wrinkle! "Are you expecting an Ivory/silver in 50x84 any time soon? Thanks!" "Can these be used on sliding glass doors?" I supposed they could be if you don't use your sliding door very much. Yes, these can be used on sliding glass doors. Yes, they are well made and on a rod would slide easily. I did that with different curtains and got rid of my vertical blinds. Loved the look. "I'm interested in the beige panels. Are they more on the tan side? Or an off white?" "I'm interested in the blue. What color blue is this? Navy blue, royal blue, grey-blue, sky blue?" That is Grey Blue. I hope it helps. "Can you describe the blue? Also how dark is the beige?"